GCSE Maths Note on Pairs of Angles, created by BubbleandSqueak on 05/08/2013. Vertically opposite angles are opposites!! Here, the two blue angles would be the same and the two orange angles would be the same because they are vertically opposite angles. These are called corresponding angles. Here, D and F would be the same because the are corresponding on the parallel lines. G and A would also be the same and B and H etc. 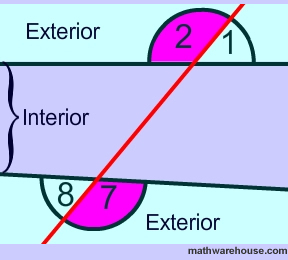 These are called alternate interior angles. Here, the two orange angles would be the same and the two green angles would be the same. They are alternate interior angles. These are called alternate exterior angles. Here, the two pink angles would be the same. They are called exterior angles because they are on the exterior of the two parallel lines.